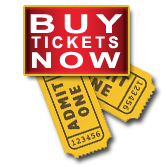 Show runs September 7 thru 23. The Little Sisters of Hoboken operate Mount Saint Helen’s School in Hoboken, NewJersey. Originally founded as a missionary order, they started out running a leper colony on an island south of France. Forced to leave the island when they lost control to a group of Protestant competitors, they returned to Hoboken. They went unnoticed until one day their cook, Sister Julia — Child of God, unwittingly served some tainted vichysoisse soup and 52 sisters died of botulism. Fortunately a few of the sisters were off playing bingo with some Maryknolls and so were spared. Upon discovering the disaster, Mother Superior had a vision — it was either Saint Catherine of Sienna or Saint Thomas Aquinas in drag (she’s not sure) — in which she was told to start a greeting card company to raise funds for the burials of the 52. The greeting cards were an enormous success and thinking there was plenty of money, Reverend Mother bought a VCR for the convent. When she realised there was only enough money left to bury 48, she decided to stage a talent show to raise the money to bury the last four sisters who were put on ice in the convent deep freeze. 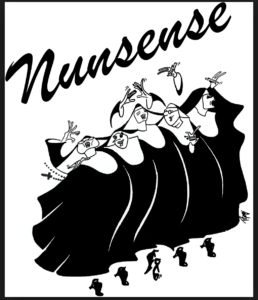 The show reflects the events of that evening of Nunsense. The program begins with a prayer and an opening song, followed by a brief history describing their difficult transition from the leper colony to Hoboken. Sister Mary Leo then describes a typical morning at the convent after which she is admonished by Sister Mary Hubert, the Mistress of Novices, to be humble. Reverend Mother is confronted by Sister Robert Anne with the fact that she is unhappy Playing Second Fiddle as the understudy and wants a solo of her own. Reverend Mother insists that her decisions are final and brings out Sister Mary Amnesia to tell the audience what it’s like to be a nun. To everyone’s surprise, Sister Amnesia has brought her puppet, Sister Mary Annette to help out. Reverend Mother is shocked at their behaviour and asks that the spotlight be turned up as she takes centre stage herself. Unexpectedly, flowers arrive from the Ladies’ Altar Society. The fragrance of the lilacs brings back memories and Sister Leo has an idea this could help Sister Amnesia. When it doesn’t work, Sister Mary Hubert leads everyone in a rousing tap number. Reverend Mother gets a little carried away and they decide to take a break. Reverend Mother is delayed at the beginning of the second half of the program and so Sister Robert Anne entertains the audience with stories of growing up Catholic. When Reverend Mother returns she informs the sisters that they have received a summons from the New Jersey Board of Health and they must clean out the freezer. The program continues as Reverend Mother and Sister Hubert perform Just a Coupl’a Sisters. Finally Reverend Mother allows Sister Robert Anne to sing a solo explaining that she just wants to be a star. This is followed by The Drive-In sung by the Saint Andrew’s Sisters of Hoboken. Sister Amnesia is then left alone on stage to tell a story. When she is telling the audience that she could’ve gone to Nashville and become a country singer she suddenly remembers who she is — Sister Mary Paul! Reverend Mother recalls that Sister Mary Paul was the name of the nun who won the Publishers’ Clearing House Sweepstakes and no one could ever find her. There is much joy as the sisters realise they have all the money they need. Sister Hubert gives some last minute advice on becoming a saint. And then the finale is sung leaving no doubt that everyone will live happily ever after!